Is CNN just giving student survivors of the Parkland mass shooting a voice? Or exploiting them to attack Republicans on gun control? Several students have granted interviews since the tragedy last week, but no station has paraded these emotionally traumatized kids on TV more than CNN. CNN hosts are interviewing these students so frequently, many are becoming household names. But rather than asking generally for their thoughts on the shooting and how they’re channeling their grieving, these reporters appear specifically interested in how they're going to use this incident to convince Republicans to enact new gun control restrictions. There are certainly many ways to approach an issue as complex as school shootings — the roles of mental health, school administrators, local and federal law enforcement, pharmaceutical drugs — yet CNN appears primarily focused on looking at this through the lens of gun control. Tonight at 9 PM, CNN is even broadcasting a two-hour "town hall" forum with Parkland students titled, "Stand Up: The Students of Stoneman Douglas Demand Action." CNN's Alisyn Camerota has been at the forefront of this trend. On Sunday, she interviewed Emma Gonzalez, asking questions that in a court of law would be described as "leading the witness." The host of Inside Politics, John King, interviewed a 16-year-old student named Lyliah Skinner, urging her to say something to the "adults" that are skeptical new gun control laws will prevent future mass shootings. 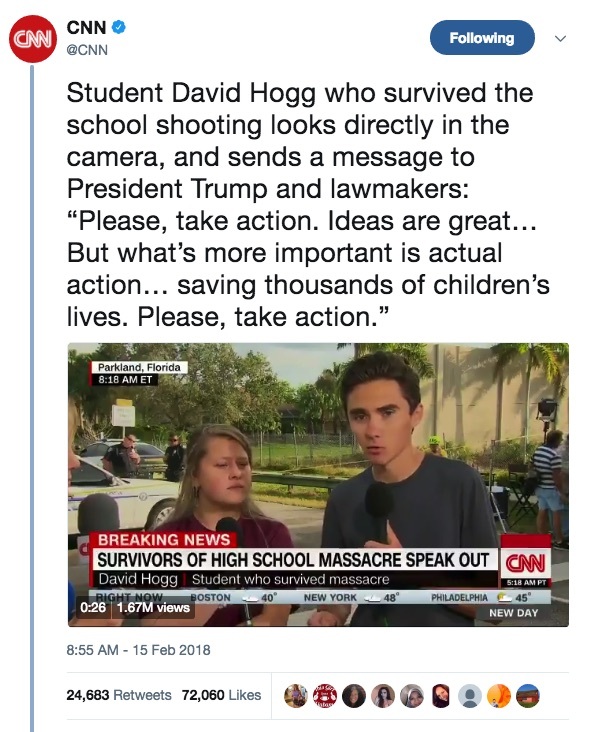 Worse, CNN has clearly already located the students they trust to serve up the hottest anti-GOP/NRA soundbites. After all, some students have expressly come to the opposite conclusion. A survivor of the Columbine massacre member of Colorado's state legislature, Patrick Neville, is proposing students be allowed to conceal carry in schools. As of today, neither of these survivors have been invited to appear on CNN.